LONDON--(BUSINESS WIRE)--According to the latest market study released by Technavio, the global barcode scanner market is projected to grow to USD 6.3 billion by 2021, at a CAGR of more than 4% over the forecast period. This research report titled ‘Global Barcode Scanner Market 2017-2021’ provides an in-depth analysis of the market in terms of revenue and emerging market trends. This market research report also includes an up to date analysis and forecasts for various market segments and all geographical regions. Barcode scanners are electronic devices capable of reading printed barcodes. The barcode scanner market is currently witnessing a surge in growth due to the increasing adoption of 2D barcodes such as quick response (QR) codes, data matrix codes, and portable data file (PDF) 417 codes. Retail, healthcare, transportation, and logistics are some of the key adopters of the technology. “Mobile computers are the most popular offering of the barcode scanners market, generating over 56% of the overall revenue. From tracking inventory to supporting field technicians, mobile computers can increase the efficiency and productivity of any business, leading to their increasing adoption,” says Chetan Mohan, a lead analyst at Technavio for embedded systems research. Mobile computers are portable barcode readers used to capture real time data for specific businesses and increase the speed, accuracy, and the number of tasks performed in a fixed time period. The introduction of multipurpose mobile computers and their increasing demand in the global market has resulted in the growth of the barcode scanners market. Handheld barcode scanners are utilized to make optimal resource utilization through asset tracking and inventory management. These portable barcode scanners are lightweight and compact, which makes them suitable to cover large areas in places like warehouses. Also, the handheld portable barcode scanners are very affordable, which has led to their wide-scale adoption by global retailing giants such as Wal-Mart Stores, Carrefour, Metro, and Tesco. These factors will drive the demand for handheld barcode scanners and increase the overall barcode scanning market during the forecast period. “Self-checkout barcode scanners are expected to quickly increase their market penetration, growing at a CAGR of close to 7% over the forecast period. These devices are adopted in retail self-checkout terminals to help customers to check out their products easily and save time,” says Chetan. The items checked by the customer are weighed and placed in the bagging area and then verified against the registered weight to ensure the accuracy of the final tally. Additionally, these systems accept payments through various methods, thereby eliminating the need for cashiers and driving for their increased adoption. Become a Technavio Insights member and access all three of these reports for a fraction of their original cost. As a Technavio Insights member, you will have immediate access to new reports as they’re published in addition to all 6,000+ existing reports covering segments like computing devices, human machine interface, and semiconductor equipment. This subscription nets you thousands in savings, while staying connected to Technavio’s constant transforming research library, helping you make informed business decisions more efficiently. 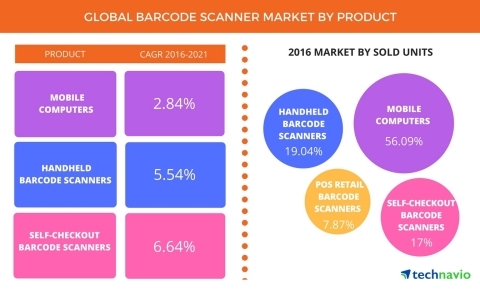 According to the latest market study released by Technavio, the global barcode scanner market is projected to grow to USD 6.3 billion by 2021, at a CAGR of more than 4% over the forecast period.